Tanks burn at the battery tank plant near Carlsbad, NM. Three people are dead following an explosion at a Caza Petroleum Lease Corporation battery tank plant near Carlsbad, NM, last Friday, officials said. The identities of those individuals were not available, said Eddy County Sheriff’s Office (ECSO) spokesperson Lt. Matt Hutchinson, but he said they are believed to be workers. Deputies got the call just before 11 a.m., and upon arrival they found a battery tank engulfed in flames. Hutchinson said multiple county fire agencies battled the blaze, which took nearly three hours to extinguish. ECSO is investigating the incident. New Mexico State Land Commissioner Aubrey Dunn released the following statement Friday night. Hutchinson said battery tanks are used to measure and test the volume of oil before it is pumped into a pipeline. 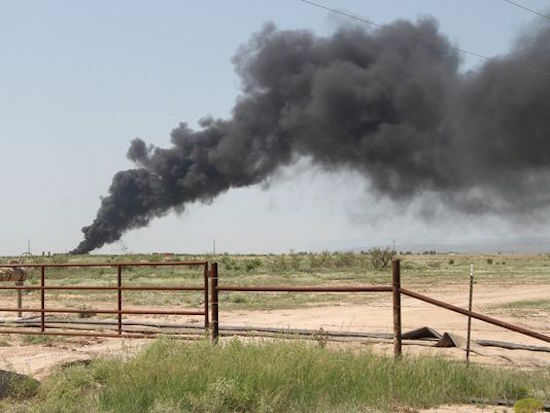 Caza Petroleum, an Odessa, Texas-based company, leased the property where the explosion occurred from the New Mexico State Land Office, according to officials in the State Land Office. Caza could not be reached for comment. Officials have not released information regarding the employer of the victims. The names of the three persons who died in the explosion have not been released pending an official report from the New Mexico Office of Medical Investigator (OMI), said Lt. Matt Hutchinson with the Eddy County Sheriff’s Office. According to the OMI, autopsies are typically conducted within the first 24 hours of receiving a body, but it can take a week or more to release a final report. Hutchinson said the Sheriff’s Office is investigating how the deaths occurred rather than the origin of the explosion and fire, which falls under the purview of other agencies. “We are determining facts, not faults,” Hutchinson said. The Eddy County Fire Service and the New Mexico Occupational Safety and Health Bureau (OSHB) are conducting individual investigations. Allison Majure, spokeswoman for the New Mexico Environment Department, said two inspectors with OSHB were immediately sent to the rural area of Otis Friday.